We dined Sunday night at a classy eatery, then paired off for last-minute chats. A new friend stopped in my room and shared how this trip had encouraged her to take the next step of regular and faithful correspondence with her sponsored child. She, like I, longed to return with our spouses for a customized visit to our children’s home towns. A department within the Compassion organization will tailor a trip to meet any special needs, budget issues, and tag them onto a vacation plan. A vacation in Antigua, for example, can have terminus at the home of sponsored children. After prayer with my new Christian sister, I doublechecked the two backpacks, one blue, one purple, that held my gifts for Juana and Wilmer, the items carefully stored by Biltmore employees in a baggage area till our return from Sololá. Again I said a silent thank-you to the dozens who’d labored so I wouldn’t have to worry. Every day, the trip price seemed more of a pittance for such quality service. By 8:00 a.m. Monday morning, we’d piled into a bus en route to the place where we’d meet our sponsored children, the aptly named Happy Days center, a Guatemalan mega-version of Chuck E. Cheese’s. “Here’s your letter.” A leader tottered down the aisle to hand me a card on which was inscribed the letter “L,” as in Lacy. “Your sponsored children will have the same letter.” I threw up my hands in amazement. Why, they’d thought of everything! As I hurried off the bus, staff directed me toward a gated courtyard. I felt my eyes narrow, then open wide at a blur of vivid colors…smiling faces. “Hola,” I whispered. “Es bueno conocerte.” She nodded and hugged me tighter. Time stood still. I heard other cries, mumblings, footsteps, but focused on this perfect small girl who wore a traje tipico (traditional Indigenous clothing) that bore the traditional markings of her Ixil people group, her blouse a glowing red, her skirt, or corte, woven of tiny multicolored threads. I patted her head. Drank in her smile. Someone’s throat cleared. I turned. There stood Wilmer, his eyes crinkled by a smile that captured his face. Another child flew into an embrace that carried all the emotion of more than a dozen letters. Finally, I turned toward four adults who’d encircled us: Wilmer’s father, Juana’s mother, Juana’s tutor, and a Compassion employee who spoke fluent Spanish and English. Juana’s mother and tutor wore variations of Juana’s skirt, belt, and blouse. Juana’s father was resplendent in a rainbow-colored traje that delineated him as Kaqchiquel, with a cowboy-style hat, long-sleeved shirt, pants, and a skirt-like garment worn in a way similar to chaps, only made from cloth, not leather. My throat tightened. I’d never forget this moment, these people. Everything brightened around our circle as if we were under a spotlight. Compassion had given me a priceless time, a priceless gift. The Compassion Trip Guide offered “conversation starters with your sponsored child,” “activity ideas.” For Juana, Wilmer, and me, it was the bouncy balls. Watching an old U.S. giant climb into a play area designed for kids under 10 had them rolling around in red, yellow, blue, and green foam balls, laughing hysterically. Balls flew about the enclosed space, some landing outside. A monitor hurried over and gently chided me for being in a kids-only zone, which again collapsed Juana and Wilmer into giggles. The effort it took to climb out, which caused the structure to sway and lose more balls, affirmed the monitor’s decision but only made my sponsored children laugh harder…if that were possible. 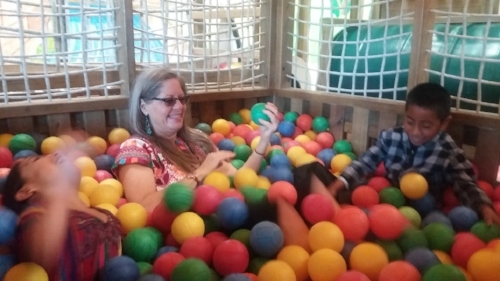 While the two children bounced among the oodles of foam balls, I fell into warm conversation with my sponsored children’s parents and tutors, who’d stayed last night, at Compassion’s expense at their first motel and had eaten their first restaurant meals. Juana had nine siblings; Wilmer, eleven. Both fathers worked as farmers, but Juana’s father currently was away, cutting sugar cane in a distant part of Guatemala. The work could be dangerous and taxing. From what I gathered (my Spanish faltered here), Wilmer’s father had a sharecropping arrangement with another farmer. He’d traveled before to Guate, but only to sell vegetables at market, only viewing the city through the dim light pre-dawn. Around us, bells dinged on the Whac-A-Mole game, balls clunked onto the Foosball felt. Children screamed and laughed under the strange green glow of thousands of neon light watts. What thoughts whirled in the mind of Juana’s mother and Wilmer’s dad, indigenous people whose forefathers for centuries had relied on God’s handiwork—looming smoky volcanoes, verdant rolling hills, lush colorful flora—to send shivers of awe down their spines? Would they see these modern playthings as a waste of time, even as harmful, polluting their children’s minds? Wilmer tugged on his father’s shirt, leading him forward, then handing him a hammer. Whac-A-Mole, father versus son, had begun. Wilmer’s father coaxed his son to hit harder and faster, maybe murmuring a Kaqchikel rah-rah. My spirits soared. Fun could be translated into several languages, especially when intertwined with matters of the heart and camaraderie through Christ. Meanwhile, on the indoor soccer court, Juana skirted past athletic men in their 20s to easily score goals. Her feet danced as she blocked goals. Wilmer finished up the Whac-A-Mole to tinker with a skateboard. The children darted from game to game, returning often to replay Foosball and soccer. Too soon we were called to lunch and were directed to a table just for us seven. Family style, we passed bowls of popcorn, slices of pizza, and the kids guzzled down refill after refill of lemonade. “Why didn’t your husband come?” asked Wilmer’s dad. “He has to work,” I explained. “He teaches at a university. It’s a hard job,” I said, then envisioned Wilmer’s dad, surely in his late 40s or early 50s, digging furrows into the ground, hoeing a garden thick with weeds. Would any job in a climate-controlled building, with paid vacation and benefits, be viewed as “hard” by either family? We said final amens and rose from the table. The time had come for our last activity, the gift exchange, to be held in an outside fenced-in area, also the site of giant inflatable slides! Wilmer kept shaking his head, surely at the enormity of the things, but Juana only needed a minute to watch crazy adult males tumble and bounce their way down and onto a grassy lawn to head up wobbly steps. Her push was firm; only widened eyes showed a trace of fear…but she slid down over and over, then grabbed Wilmer’s hand and coaxed him along. We six gathered under a tree by the fence. I presented each child with the backpack that I’d filled with a soccer ball, pump, the Crayola 120-crayon box, coloring books, toiletries…the things I’d lugged from Target in Bloomington, Normal, U.S.A., to Happy Days, Guatemala City, Guatemala, Central America. The children had muted responses to their presents; I couldn’t tell if they were overwhelmed with the amount of things, if they were unsure how to respond, or if they were just acting like kids who’d taken their first long trip, stayed their first night in a motel, eaten several meals at restaurants for the first time ever…if they were just plump exhausted and/or overstimulated. I took the cloth from him, ran my finger across the beautiful weaving, and clasped his hand as I said thank you. Then Juana’s mother presented a gift from her region. We sat down in the grass, the adults continuing to talk about their lives. Juana and Wilmer kept piling and unpiling their gifts, acting more comfortable with them. They most focused on the coloring books and crayons. I couldn’t get enough of their contented faces, the natural way they sat close to me. Our leaders announced it was picture time. 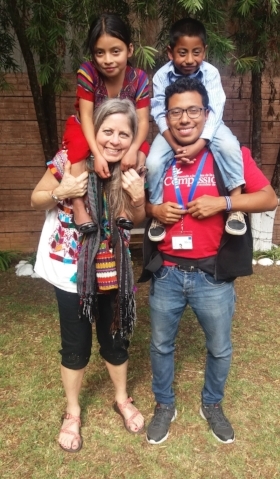 I got the brilliant idea of giving Juana a final piggyback ride; with a harrumph, our savvy Compassion partner, who didn’t want anyone left out, pulled Wilmer onto his back for a brief piggyback war. Then we posed for several group pictures. Juana, Wilmer and I are standing between the “T” and the “M” of the Guatemala sign! “It’s time to say bye,” came, as I knew it would, though the words put a bad taste in my mouth. Why did an ocean exist between us, an ocean of red tape that refused to allow simple egress from there to here? An ocean of obstacles like resources and politicians and rules? In less than half a day, Juana’s and Wilmer’s people had become a part of me, and I would never be the same after our talks and prayers and praises… most of all, I would never be the same after seeing our kindredship in Christ. I hugged both children, who clung to me like they felt something of what I felt. Tears fell down the face of Juana’s mother. “I will never forget meeting you,” she said, again using her daughter’s tutor to share her feelings. The words only validated what I’d already been told by my heart. Our group leaders herded us out the gate and we boarded our buses. Last-minute details must’ve arisen, because the bus idled for maybe half an hour. “Hey, Patti look!” someone cried. In a nearly empty parking lot stood Juana, her mother, and her tutor, waving, thanking…caring. They stood there as our bus finally pulled out of the Happy Days center, rounded the corner, and turned onto a boulevard crammed with honking cars and sputtering chicken buses. A sense of loss fell over me, and I longed to weep at the fact that we had to say good-bye, yet the next minute I recalled those two innocent and beautiful faces and wanted to bounce like a little kid myself on the bus seat. Quiet had befallen our usually talkative group, so maybe emotions overpowered them as they had me. No words could describe my conflicting moods. How could I say bye to ones I’d just begun to know? Why couldn’t our worlds intersect on a more regular and more personal basis than letters? Our group climbed off the bus. Some had regained their cheer and raved about the day with the children and their families. That night, Compassion reserved a private room for dinner that allowed us to share what we’d learned from the trip. Coleader Sandeep encouraged us to process the experience; Emily did a great job giving hugs and telling every participant what she’d loved about them. The night brought more goodbyes as our team for the last time gathered into huddles. The day’s excitement spilled out, with stories both sad and wonderful and miraculous. A family that had struggled with addiction learned from their sponsored child’s mother that her son had an alcoholic, abusive father. One story broke my heart; the next knitted it back together. I began to experience a tangible ache, a tiredness, a need to rest, especially remembering about my 3:45 a.m. wake-up call, which would ensure a 5:00 a.m. departure for the airport. Inside the comfort of my hotel room, I curled into a ball on my comfortable bed. Were Juana and Wilmer enjoying their second night in a Guate motel? Did they kick the soccer ball in a nearby patio, play catch with the Frizbee, or get to work on those coloring books? I kept whispering, “Thank You, Lord,” unable to express how humbled I’d been by the kindness of the Father to allow such an experience. I thought about getting my journal, but I couldn’t summon enough energy to move. Would I ever be able to condense what I’d learned comprehensible to anyone, including myself? A month after my trip, my husband and I stayed at an Airbnb operated by Joe and Nancy Gatlin, who, along with Joel H. Scott, authored a book entitled Companeros, Two Communities in a Transnational Communion. When Joe learned that I was a writer, he gave me a copy of his book, which placed in scriptural context the equality of all believers through their sonship with Christ, the elements of poverty, politics and distance that created the nearly insurmountable chasm threatening to keep me and my new friends separated, and how I could best respond to the opportunity offered by Compassion’s ministry. By seeing myself as blind and poor and a weakling who shunned the role of suffering in faith, I better understood the richness demonstrated in the lives of believers like Juana’s and Wilmer’s families, who’d endured genocide solely because of their identity as indigeno, who daily faced poverty, who, despite these obstacles, very often lived richly within their church community, in personal faith, in family cohesiveness. It took 2,745 miles, thousands of dollars, and a prodigious amount of reading to decide that Compassion provides a Biblical way to engage believers from other countries who face corruption, hunger, shortage of water, unemployment, and gang problems, yet who live with joy and hope in the Jesus Who daily provides tortillas and potable water and occasionally a chicken or fresh vegetables, believers whose involvement in a church community might mean the difference between life or death, a community that’s survived betrayals, that’s mourned over genocide victims still not found, that’s shared food when it’d be easier and seem smarter to hoard. Though I provide monthly stipends to Juana’s and Wilmer’s family, it is the Guatemaltecos who teach me how to love God even when He doesn’t answer prayers. May I grasp my brothers’ and sisters’ hands and learn from them, then share from my poverty. For now, may we be together as often as possible, Lord, and envision the day we sit close enough at Your table to see each other smile. Strong campesinos with dark eyes and lean frames teach gringo friends how poor and weak we are. Planting rows of corn on steep green hillsides they’ve waited so long to own, they lay claim to the land that God has given them to steward. Feeding young minds with education, they sow a crop to grow a new generation of leaders who will not forget their martyrs nor their deliverance yet are moving forward to claim the banquet is for all.